This is the second in a series of reviews of Bibles/Bible storybooks for children. Review: The Kids’ Quest Study Bible is very readable and the translation is quite similar to the New International Version which many congregations use today. This study bible would be appropriate for both boys and girls. It is a real study bible, not an abridged story bible, and comes with both a dictionary and subject guide to assist the reader in locating specific areas of interest. Each book has an introduction that includes: who wrote the book, why was it written and what happens. The text is two toned and easy to read. An interesting feature of this study bible is that it includes questions for reflection and thoughtful discussion however, each question has an answer provided which often comes across as being a “little preachy” and does not allow the reader to formulate their own response based upon their interpretation of the text. Also, the cover with its game-board appearance and the inside artwork of Jason and his friend the hedgehog are attempts to make the Bible look more cartoonish and therefore more appealing to kids, but it also seems to take away a little of the reverence that should be appropriated to the Holy Bible. Anyhow, this little problem could be easily overcome by purchasing or making a personalized cover for the bible. 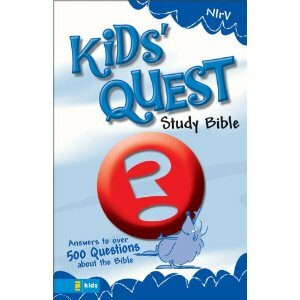 Kids’ Quest Study Bible by Storypath is licensed under a Creative Commons Attribution-NonCommercial 4.0 International License.